Terry Norberg has been capturing Capital High School football games since the late 1970s. Since 1975, Ed Stevens, Jack Swarthout, Wayne Sortun and now John Johnson have coached the Capital High School football team. During that same time, one thing has been consistent. For nearly 40 years, Terry Norberg has rarely missed a Cougar game. He’s almost like the national anthem – a part of the game. Since the late 1970s, Norberg’s been there at the games, video taping nearly every play, every touchdown and every tackle. As a teacher and editor of the school’s Capital News Service, Norberg first began capturing the games on video in the late 70s. The footage Norberg shot would then be shown on the school’s closed circuit station. Sometimes, the coaches studied Norberg’s video of the game. Eventually, Norberg videotaped the games just for the coaches. In 2008, Norberg retired from teaching after 38 years, spending all but five of those years at Capital. 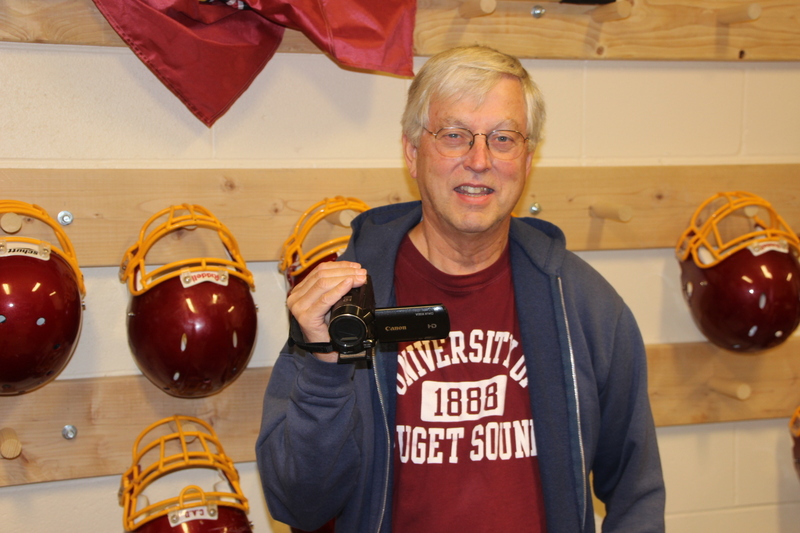 But Norberg, a 1962 graduate from Wahkiakum High School in Cathlamet, didn’t want to retire from being the Cougars videographer. He’s having too much fun. Norberg can recall and recap some of the biggest moments in Capital football. He has videoed every play in the Cougars run to state titles in 1996 and 1998. He remembers the scores, the players’ names and the plays of that run. “My favorite game was the first year we won the state title in 1996,” Norberg said, setting up his detailed account of the team’s playoff run that year. Terry Norberg often looks for the premiere spot to get the best images of the Capital football games. First, there was a pigtail game on a Tuesday at R.A. Long in Longview. Then on a Saturday night in Memorial Stadium in Seattle, Capital beat No. 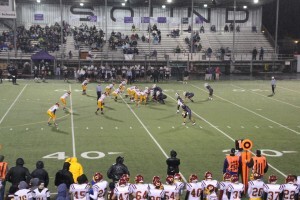 1 ranked O’Dea. Darren Tinnerstat, who is now an assistant coach at Capital, was the Cougars big-play quarterback that game. And Kyle Camus, who is now also an assistant coach with the Cougars, started at tackle. That fella was hardly an O’Dea fan. Lots of plays stand out in Norberg’s memory. One was about Jordan Carey, the sure-handed speedster who went on to play wide receiver at the University of Oregon. Then John Oatman, the Cougars’ quarterback that day, tossed a deep pass 50 yards to a sprinting Carey. Norberg enjoys recapping some of his favorite Capital High School games. Carey, Norberg said as he recounted the play, lined up on the right side. Tony Davis, who was a sophomore and would go on to play at Eastern Washington University, lined up on the left side. 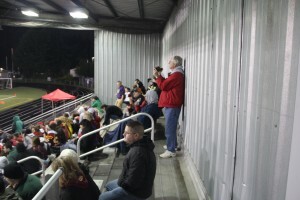 To get the best vantage point to video the games, Norberg always headed for a spot above the field. Often, that was the press box. 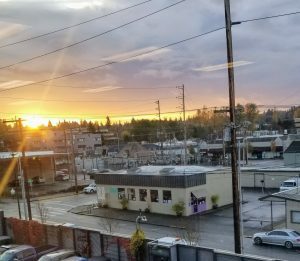 But sometimes those vantage points were less than ideal and hard to reach. Adding to the challenge was a steady rain. Capital High School football coaches review Terry Norberg’s videos of games. At Ingersoll, where Capital has played all its home games for 39 years, Norberg used to climb up on the roof of the stadium to shoot the game. Eventually, for safety reasons, that was stopped and now he crowds into a press box that’s often packed. “You count over 20 people and you count the average weight and you start to wonder if this is really a good idea,” Norberg said with a laugh. Through all these years, Norberg has had an understanding and supportive wife. “My wife loves football, but she also likes doing things,” Norberg said. Recently, to help satisfy that desire, Norberg, along with his wife and daughter, headed for Yosemite. But Norberg had a timeline on their trip. 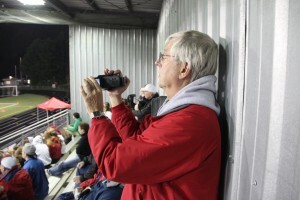 And even after all these years Norberg hasn’t lost his love and passion for being at the game, capturing it on video.